When you hear the word “caramel”, you most likely think of a soft brown candy, made by slowly cooking sugar. But “caramel coloring” is not the same thing. That artificial ingredient, used in products such as Coca-Cola and Pepsi, is made by combining corn sugar with chemicals such as ammonium and sulfates under high pressure and temperatures. The Center for Science in the Public Interest (CSPI) is calling on the FDA to revoke the Generally Regarded as Safe (GRAS) status of caramel coloring, an ingredient found in many foods. Caramel coloring contains 4-methylimidazole (4-MI or 4-MEI), a known animal carcinogen. That compound forms when ammonium or ammonium and sulfites combine under certain conditions. It has no nutritional value and no flavor, despite its name, but simply colors foods and beverages brown. There are four classes of caramel coloring. The CSPI is focusing on Class III, which is made with ammonium compounds, and Class IV, made with ammonium and sulfite-containing compounds. The CSPI originally petitioned the FDA to remove artificial caramel coloring from the GRAS list in February, 2011. They also want the government to require the phrases “ammonia process caramel” or “ammonia sulfite process caramel” on food and beverage labels, rather than the more innocuous-sounding “caramel coloring”. The FDA bans carcinogenic food additives from the food supply, but contaminants in food additives, such as 4-MI, are allowed as long as they cause only one cancer per million people over a lifetime. California, which has the strictest 4-MI regulations in the country, added 4-MI to its list of carcinogens in 2009 under Proposition 65. Regulators in that state say that consuming more than 16 micrograms per day would cause one cancer per 100,000 exposed people. The state has set an upper limit of 29-micrograms of 4-MI per serving; above that, the product must carry a warning label. The CSPI has estimated, based on the California model, that the 4-MI in Coke and Pepsi is causing 4.8 cancer cases per 100,000 people over a lifetime, or about 15,000 cancers. A study conducted by the National Toxicology Program found clear evidence of 4-MI carcinogenic activity in male and female mice. That compound causes lung, liver, and thyroid cancer in mice and rats. But FDA spokesman Doug Karas says that human beings would have to drink more than 1,000 sodas a day to consume the same amount of the chemical given to the lab animals. Nutritionists say that the high sugar and high fructose corn syrup levels in soda are more of a concern than caramel coloring. 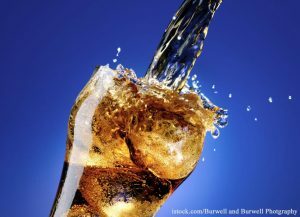 In response to the CSPI’s petition, the American Beverage Association (ABA) released a statement that said, “Time and again, and even very recently, leading public health organizations have reaffirmed that caramel coloring, including the trace amounts of 4-MI found in it, is safe for use in colas and countless other foods.” The ABA, along with other organizations, has filed a lawsuit against California regulators to remove caramel coloring from its list of carcinogens. The manufacturer of caramel coloring that supplies that ingredient to Coca-Cola has agreed to change its product to meet California’s standards.